I am currently visiting the USA from the UK (I am a UK citizen) and am intending on staying here for the full 90 days under the Visa Waiver Program. How long would I have to stay out of the US at the end of this period before returning again? Would I have to return to the UK, or could I stay with friends in another country (such as Canada) for a while? It all comes down to a 'reasonable length of time' between stays. Now that's about as ambiguous as they come - what's reasonable? It's like this on purpose - it's up to the official at the border, as the purpose of this is to try and work out if you're trying to live in the states and just border hopping every 90 days, instead of visiting. When traveling to the U.S. with the approved ESTA, you may only stay for up to 90 days at a time - and there should be a reasonable amount of time between visits so that the CBP Officer does not think you are trying to live here. There is no set requirement for how long you must wait between visits. "The Visa Waiver Program (VWP) enables nationals of certain countries, including Australia, New Zealand, and the U.K., to travel to the United States for tourism or business for stays of 90 days or less without obtaining a visa, if certain requirements are met. Under the VWP, time spent in Canada, Mexico, and adjacent islands counts towards the maximum of 90 days stay allowed under the program." Short version - it doesn't matter, what matters is convincing the border officer that you're visiting, not living in the US. If you go to Canada and Mexico or the Caribbean, and while you are there, your initial 90-day period of entry expires, but you need to come back in to the U.S. to fly home, you may encounter a problem. The terms of the VWP are very clear - it is only to be used for occasional, short visits to the U.S. If the CBP Officer thinks you are trying to "reset" the clock by making a short trip out of the U.S. and re-entering for another 90-day period, you can be denied entry. (If that happens, you will have to obtain a visa for any future travel to the U.S.) In order to be re-admitted to the U.S. shortly after a previous admission expired, you will have to convince a CBP Officer that you are not trying to "game" the system. It's not an official regulation but a "rule of thumb". There is no official rule on this. It is up to the discretion of the customs office dealing with you at the border to decide if you can or can't enter. This applies whether you have a visa or wish to use the Visa Waiver Program (VWP). The prime directive of the officer is to assume you wish to permanently live in the USA (i.e. immigrate there). It is up to you to prove otherwise. The amount of "proof" required may be as simple as your verbal statement that you intend to do XYZ whilst there, and intend to leave on XYZ date. Yet there are scenarios that tend to trigger suspicion at boarder control. For example, if the records show you have been spending more time in the USA than you have outside the USA, the officer may decide you are misusing the VWP system to "live" in the USA. 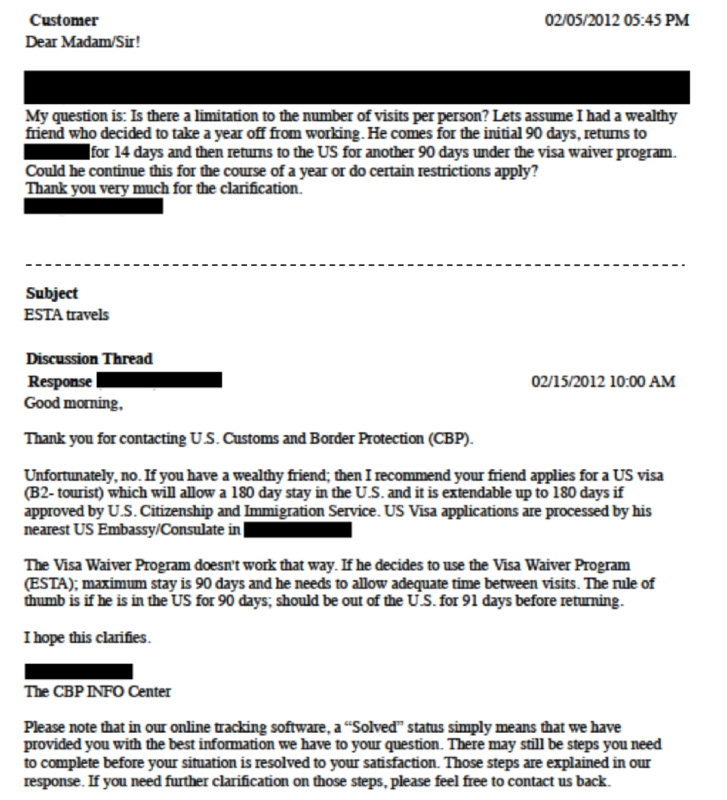 Another example, if you have previously stayed in the US for a maximum 90 days on the VWP, and then you return, let's say, within 12 months of your previous entry (although, it's totally at the discretion of the officer you deal with) this can alert them to questioning you more throughly. I know of numerous first-hand cases when that second scenario has played out. One was a friend from Sweden who stayed 89 days on the VWP. She returned 11 months later, to visit for another 80 to 90 days (which she told the officer), and she was taken aside for 3.5 hours of searching and questioning. She missed her connecting flight, and had to go to great lengths to convince them she had zero intention or desire to immigrate there. Not the answer you're looking for? Browse other questions tagged usa us-visa-waiver-program repeat-visits or ask your own question. Visiting the US twice under one ESTA? If I leave the US how long do I have to be out of the country before I can return? How soon can I re-enter the USA after staying there for 60/90 days ? when does the program re-set? I visited the US for 2 weeks in May; can I return in November for 2 more weeks? Can an Australian enter the USA once a month, from Mexico, under the Visa Waiver Program?